SOUTH Down MLA Chris Hazzard has welcomed a recently unveiled work scheme to be carried out in Castle Court Estate Killough. The plan will see a number of environmental improvements to the area including re-paving, re-planting of trees and shrubbery and a general tidy up of the area. Mr Hazzard said: “Recently I led a Sinn Féin delegation to meet with Housing Executive staff and raised a number of concerns about the appearance and safety of the estate for residents. 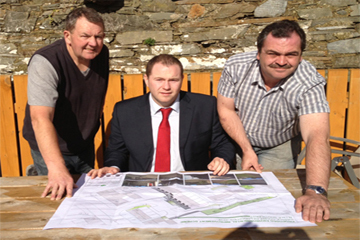 Ronan O’Donnell, Killough resident with South Down MLA Chris Hazzard and Down District Councillor Liam Johnston look over some proposals on Killough environmental improvements. “Following this meeting, I am delighted that they have developed this plan for the Castle Court Estate. I would like to thank them for their endeavors to date. This fantastic scheme will improve the overall appearance of Castle Court whilst addressing some health and safety concerns we raised. “Some of the planned work includes the re-paving of the entrance to the estate and other areas; re-planting of trees and shrubbery to improve the appearance of the estate; the painting of existing fencing and the lowering of man-holes which where presenting as hazardous. “I am pleased that this work will begin shortly and therefore coincides with other cosmetic and structural work carried out by Roads Service following representation from myself and my colleagues Councillors Liam Johnston and Eamonn MacCon Midhe.